Ousted Pakistani Prime Minister Nawaz Sharif and his daughter Maryam, both facing lengthy prison terms, were arrested minutes after landing in the country on Friday as they returned seeking to revitalize their flagging party ahead of a July 25 election. “I’m aware of the fact that I’ll be jailed, but it’s a very small price to pay for the great mission to save the sanctity of the vote in Pakistan,” Sharif told Reuters on board the plane minutes before touching down in the central city of Lahore. Uniformed men escorted the Sharifs, who were sentenced in absentia on corruption charges last week, off the commercial flight, and a spokesman for their Pakistan Muslim League-Nawaz (PML-N) party confirmed they were arrested soon afterward. Their return represents a high-stakes gamble, but could shake up an election race riven by accusations Pakistan’s powerful military is working behind the scenes to skew the contest in favor of ex-cricket hero Imran Khan. He describes Sharif as a “criminal” who deserves no support. Clashes broke out on Friday evening at the main highway entry point to Lahore between pro-Sharif protesters and police who had been deployed in the thousands, a Reuters witness said. There were no immediate reports of injuries. The security situation has improved in recent years in nuclear-armed Pakistan, but the substantial threat still posed by militants was starkly illustrated by the suicide bomb attack on an election rally of a regional party in Baluchistan Province, in southwestern Pakistan, that killed 128 people. ISIS claimed responsibility for the attack, which took place at a rally for the Baluchistan Awami Party (BAP). Among the 130 killed was the party’s provincial Assembly candidate Siraj Raisani. After their arrest at the airport in Lahore, Sharif and his daughter were immediately put on another plane and flown to the capital Islamabad, PML-N media coordinator Muhammad Mehdi said. Local media said they were then taken to Adiala jail in the nearby garrison town of Rawalpindi. 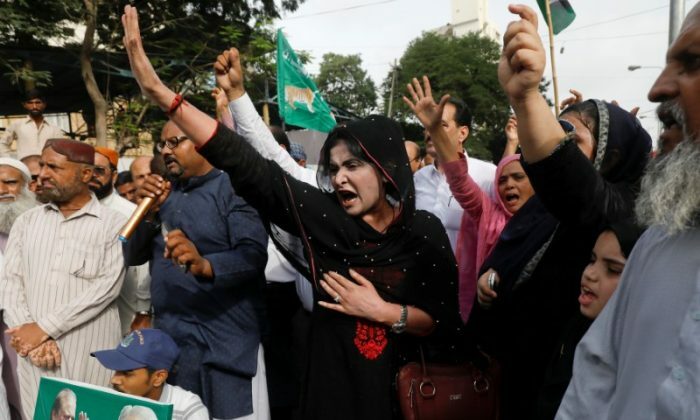 Their swift departure prevented PML-N workers staging a hero’s welcome on the streets of Lahore, where Sharif’s brother, Shehbaz, led between 10,000 and 20,000 party supporters on a march in defiance of a citywide ban on public gatherings. The prohibition is pursuant to Pakistan’s Constitution, which requires a cessation of rallies in the run-up to an election. Sharif returned from Britain after an anti-corruption court handed him a 10-year jail term and sentenced his daughter and political heir to seven years in prison over the purchase of luxury apartments in London in the 1990s. Sharif alleges the military is aiding a “judicial witch hunt” against him and the PML-N. The party’s past five years in power has been punctuated by the civil-military discord that has plagued Pakistan since its inception. Sharif’s return from London, where his wife Kulsoom is critically ill and undergoing cancer treatment, comes at a time of dwindling fortunes for his party, which a year ago was considered a runaway favorite to retain power. Sharif was ordered jailed in a case stemming from 2016 Panama Papers revelations that showed they owned the apartments through offshore companies. Maryam was convicted for concealing ownership of the apartments. They both deny wrongdoing. After the Supreme Court ousted Sharif as prime minister last July, the courts barred him from heading the party he founded. His brother Shehbaz became PML-N’s president, but Sharif remains the power behind the throne. Since then, a host of his allies have been either disqualified by the courts, or face corruption cases. Many PML-N lawmakers have also defected to Khan’s party. PML-N has also been shaken by internal divisions. Sections of the party oppose Sharif’s combative approach against the army and fear it will turn off voters in a deeply conservative and patriotic Muslim nation of 208 million people.